The Financial District is a business district in Downtown Toronto, Ontario, Canada. 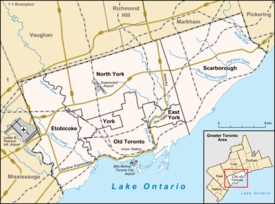 It was originally planned as New Town in 1796 as an extension of the Town of York (later the St. Lawrence Ward). It is the main financial district in Toronto and is considered the heart of Canada's finance industry. It is bounded roughly by Queen Street West to the north, Yonge Street to the east, Front Street to the south, and University Avenue to the west, though many office towers in the downtown core are being constructed outside this area, which will extend the general boundaries. Examples of this trend are the Telus Harbour and RBC Centre. The district's origins date back to the mid to late-19th century when a number of early banks had head offices located in Toronto. Most of these banks were regional and came and went. It was not until the second half of the 20th Century that the Big Five banks located their headquarters there. The Financial District from the air, 1920. The Toronto Financial District Business Improvement Area was later resta in order to represent all commercial businesses in the within the district. The organization engages in streetscape improvements, addressing key issues that impact the area, and promoting the area's businesses online. Completed in 1929, the Art Deco Toronto Star Building was one of several historic buildings torn down as the district developed in the mid-20th century. A worm's-eye view of the Financial District's tallest structure, including three of Canada's tallest building. The following is a list of buildings in the Financial District over 200 metres (660 ft) in height. Opened in 1929, the Fairmont Royal York is a hotel that sits on Front Street, the District's southern boundary. ^ "First Bank Tower". Emporis.com. Retrieved 2008-02-18. ^ "First Canadian Place". SkyscraperPage.com. Retrieved 2008-02-18. ^ "Scotia Plaza". Emporis.com. Retrieved 2008-02-18. ^ "Scotia Plaza". SkyscraperPage.com. Retrieved 2008-02-18. ^ "Toronto-Dominion Bank Tower". Emporis.com. Retrieved 2008-02-18. ^ "Toronto-Dominion Bank Tower". SkyscraperPage.com. Retrieved 2008-02-18. Wikimedia Commons has media related to Financial District, Toronto.